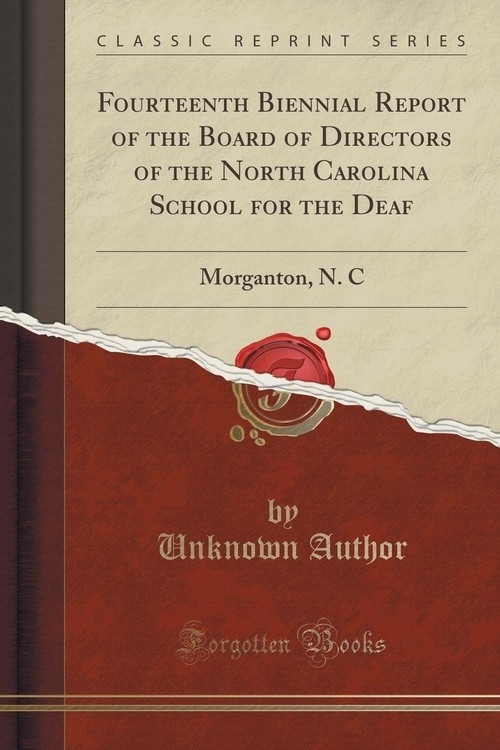 I have the honor herewith to submit the fourteenth Biennial Report of the Board of Directors of the North Carolina School for the Deaf, and respectfully ask your careful examination and consideration of the progress and activities of the School, during the past two years, which have been most strenuous owing to the conditions brought about by the war. However, not a day has been cut off the school term and we have endeavored to maintain the high standard of the work that this school has enjoyed for many years. At the close of this school year we shall have rounded out a full quarter of a century under the same management. During the last two years we have enrolled 381 and had 303 in school at one time. It should be gratifying to the management and the state at large that we have reached so large a per cent of the eligible deaf children. It has been our aim to keep pace with the educational spirit that has been manifest all over our state, as well as to keep abreast with the best schools for the deaf in the United States. There has been no change in the policy of the years past. Some changes in the staff of teachers and officers will be found in the report of the Superintendent. The legislature of 1917 allotted our school $60,000 of the bond issue, and this year $15,000 was paid to this school to build a hospital.